What's wrong with Obama's hand in that official portrait? I'm gonna go out on a limb here: I generally like the Obama official portrait. It's an odd style, but it expresses him, and what's more, it reflects the art of his era. It has a background that appears computer-generated as a flowey pattern, with a quite flattering visage of the first black president in a realistic rendition in the foreground. It's a composition that creates the appearance of vector art mixed with a photograph, very modern in the era of cell phones and quite similar to the mixed-media animation being produced by Hollywood. I can feel the vibe of Playa del Rey and South Central and Melrose Avenue through this piece. And Obama, of course, spent massive time during his presidency hobnobbing with the likes of Harvey Weinstein and other Hollywood bigs at fundraisers around Los Angeles, so it's very him. 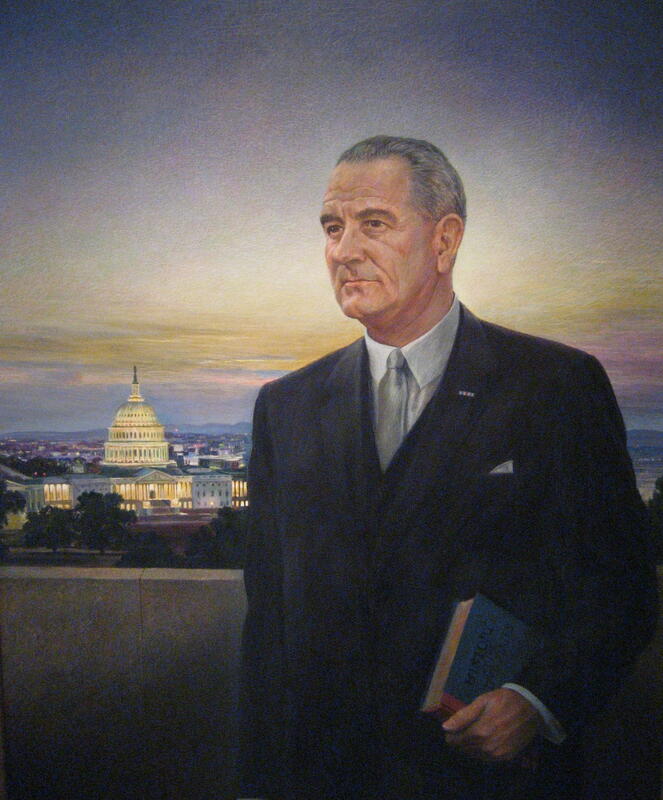 It's good just as Peter Hurd's official portrait of Lyndon Baines Johnson was good. (That was a more-flattering-than-he-deserved portrait, done in the most modern representational style of the era, which was done in the characteristic renditions of this Western artist, who also did this beautiful piece.) Johnson, inexplicably, hated it and got a poem about it by Richard Wilbur for his idiocy. Obama, on the other hand, loved his image, which says something about him as well, in more ways than one. Here's the problem: It's not drawn very well. The work shows a lack of skill in the basic rendering of an image. The hands are out of proportion in size, even placed in the foreground, overly big. One might be able to write that off as intentional, maybe a snarky contrast to the left's claims about President Trump's hand size and I am sure it was. But the front hand itself has problems in construction, at least if the aim is to create a realistic hand placed against a surreal background. Look at the problem: The fat pad under the palm seems to extend upward into the first half of the little finger. Some observers think it appears like a concealed thumb placed on the wrong side. Now it is possible to have a fatty hand with flesh that could extend that when pressed down; I went over some of my own drawings of hands to get that inference. But one would have to have exceedingly loose skin, which Obama does not have. There also should be skin-fold lines dividing the bottom of the little finger and the palm, at least if the hands are to be anatomically correct. Another problem is that the wrist is exaggerated in its thinness. No man has wrists that thin unless his entire stature is diminutive – again, which Obama's is not. The artist shows an embarrassingly weak ability to draw. And maybe that's inevitable in this era. Drawing is devalued generally as photocopies and computer-generated graphics have taken over. It's just as spelling has been degraded by spell-check. When you can use a tool on an Adobe program to draw a perfect circle, you end up not being able to draw one freehand, because you no longer observe or practice. Drawing takes practice, daily practice. This is why Rubens, Degas, da Vinci, Delacroix and every classical artist there is had scads of notebooks - it was to keep practicing. When I was a fine art student at Santa Monica College, where classical art was studied and copied intensively and was required of even the most out-there artists, we had to fill notebooks, drawing anything around us, repeatedly. It's the only way to get good. One thing I learned from my professors there was a complaint of many professors in Los Angeles's top art schools – and there are a lot in that city, including the rigorous Santa Monica College – is that incoming students in the age of the photocopy, the trace, and the computer-generated design, really aren't coming in anymore with an ability to draw. That brings us back to Kehinde Wiley. He says he grew up drawing, but he doesn't, at a minimum, seem to have kept in practice. He's known primarily as a showman, according to this 2012 profile in New York magazine, and he employs a lot of assistants, in China, in Senegal, and in the states. His art is basically factory art, though it's quite possible that, as a black gay artist commissioned to do Obama's portrait, undoubtedly excited about the commission, he chose to do this one himself. Well, the lack of technique shows. No wonder there was a pretty conscious effort, at least among my lefty professors at SMC, not to teach or recommend Wiley's work. So far, he is not taught in reputable schools, although many modern artists are. The New York magazine piece says he's primarily a showman, which is an L.A. thing, I suppose, and he has made a lot of hay as a black man who references classical white culture and appropriates it. (Appropriation is not a dirty world in the postmodernist art world.) He's, in short, an affirmative action creation of the gallery world, which longs for a black artist to showcase. Wiley's skills seem to have fallen short of such attention. This is not to say he's not a fresh, original art voice in a sea of same-old abstracts. His work does stand out, and I think he is. But his skills are lacking, which makes him a bit less of an artist and more of an attention-getter. His art may just be less art. Even the most deconstructive painters out there have historically had to learn to render representatively to produce art, to develop their skills, and those skills are necessary even in the creation of non-representational art. Pablo Picasso is a prime example of that. What we have here, in the Obama portrait, then, is not just a flattering portrait of Obama, and not just a utilization of the vector arts of the era, but also the loss of culture – in the affirmative action that got Wiley his commission and his fame (he gets $100,000 a pop for his portraits, according to the 2012 New York magazine piece, probably a lot more now) and in the factory art setup that allowed him to open multiple studios of assistants globally. We also have another example of someone dependent on technology that is so extensive that it debilitates his capacity for drawing. In the past, artists were rewarded by their skills and merit. Today, it's all razzle-dazzle plus the right political correctness. It represents the Obama era perfectly.